Last Friday I took my students to the mall to go shopping for their family members. Thankfully, parents sent in lists so that they, um, I... didn't have to guess what everyone in their family would want for Christmas. I don't know about your students, but my students love to shop for the things that they like...not necessarily what others would like. We need to practice this more in the classroom, so I created some worksheets and am sharing those with you! 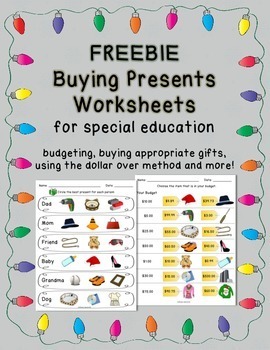 Some worksheets focus on simple perspective taking and choosing an appropriate present for various people. Another worksheet works on choosing a present within a budget (with two levels, the first with the exact budget amount and the second with an amount under the budget). And last, a couple leveled worksheets work on paying for items using the dollar over method. That sounds great! Thanks so much for sharing. I'm so glad you were able to use these :) Merry Christmas! I am doing the I could buy worksheets tomorrow. I put together a lesson where we read a the giving tree, then practiced thinking about what other people would like. The independant practice will be to do the worksheet.